My cross-country sustainable farm tour has afforded me the opportunity to contemplate the day-to-day workings of a variety of farms and families. On Day 1 of the farm tour, I was confronted with a farmer in bright white attire and a newborn baby in a sling across her shoulder. I wondered how much farmwork she was doing and how her clothes stayed so clean. This wasn't my image of a family farmer, but maybe it should be. In order for agriculture to be sustainable, it must be based on systems that will last for centuries. And that might possibly involve babies. So what is a family farm, and are there many left in the United States? Here are some criteria that I would use to capture the essence of a family farm. The family would live on or near the farm. There would be some diversity in terms of the crops and livestock grown. Farm size would be such that family members would do the vast majority of work on the vast majority of days. Children in the family would help out as appropriate for their age. By the time they were late teenagers, these children would have the know-how to go into farming, if they so desired. I am the first to admit that quantifying this would prove difficult. It's a little tough to decipher how the U.S. Department of Agriculture (USDA) defines the family farm. There are four legal categories - family/individual, partnership, corporation, and other. But corporations can be family-held or not family-held. Two siblings might form a partnership and continue to farm together. As they get closer to retirement, a couple might put its farm in a trust, which is part of the "other" category. So these categories make the resulting statistics less than helpful. Luckily, there are also categories based on sales and size. Every 5 years, the USDA conducts a Census of Agriculture. Based on farm size or farm sales, the trends are the same. There are fewer farms than there used to be, except for humongo farms. There are more farms of 2000+ acres and more farms that gross $500,000+ in sales. But there are still a boatload of small farms. Looking at farms by size, in 2012, there were about 1.5 million farms under 179 acres. Looking at farms by sales, in 2012, there were about 1.6 million farms with sales under $50,000. With 2.1 million farms reporting in, 69%-75% of them are on the smaller side. In the end, although they provide an abundance of statistics, I don't think the USDA is tracking family farms at all. On my farm tour, I have not generally known the demographics of any farmers, until arriving at the farm and meeting them in person. As it turns out, most of the farms, I have visited so far, pass the I'll-know-it-when-I-see-it test for a family farm. Many of the farmers I have visited do not look kindly on government interference in their lives. They feel it is their responsibility to raise their children and pass on their values and knowledge to their offspring. Living on a farm provides them ample opportunity to do so. Eat Wright Farms is a classic example. Morgan and Josh include their baby and toddler in farming activities. Everybody has a pair of mud-sloshing boots to tool around in. Their older toddler, Owen, showed me how to identify four edible weeds that grow around the farm. He even had his favorites. Josh works full-time as a firefighter off-farm, and Morgan is the primary caregiver. As I interview Morgan, Josh takes over with the children. And Josh's parents, who live down the road, are available for babysitting. Josh and Morgan are passionate about farming, and hard work, and about having their children nearby to participate. Before embarking on this tour, I checked out a hydroponic farm near me. When I arrived, the first to approach me were a couple of elementary school-aged children. It was a Friday, and school was still in session. They might have been tourists, but as it turns out, they were the farmer's children. Mom home-schools them. So, when she works at the farm, the children join her. And on the day I visited, she was running the farm stand along with several employees. While she was attending to a customer, she sent me off with her 8 year old. This child knows more about gardening than most adults. She started her own small plot with tomatoes, kale, and green peppers. The farm has a complex drip fertigation system, but not so the daughter's garden. For her irrigation system, the daughter makes uses of her bicycle to transport a bucket of water. Due to such attention to detail, her garden is in better shape than her brother's. She grows more food than she can eat, so she sells some of it. She donates all her profit to charity. Home-school math classes involve running the cash register on market days. The farm uses no calculators or computers at the market, so all sales involve her arithmetic prowess. I have visited a couple of farms with teenagers on board. 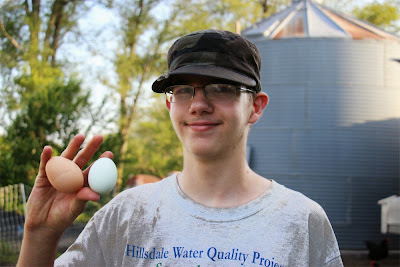 These young people were intimately connected with the family's farm activities. Since they also attended high school and had a social life, they only put a fraction of their energies into the farm. What struck me was how proud they were of their work on the farm and how forthcoming they were when discussing their participation with me - an adult and a total stranger to boot. The sullen and defiant teenager stereotype is not alive and well on the farms I visited. I don't buy into the romantic notion that all farm-raised children are more respectful and ready to help out. But, the ones I met certainly were. The phrase, family farm, exerts a powerful pull on the American imagination. And yet, farm children have been abandoning farming for the last few decades. Rebecca Williams, of Many Fold Farm, shared her vision of passing her farm on to her children. In her view, the commodification of farming has led to huge farm debt, reduced profits, and a dissociation of those who grow the food from those who eat the food. It has also led to cheaper and cheaper food that continues to put small family farmers out of business. But today, people want food they can trust from farmers they can trust. And family farmers fit that image. From Rebecca's perspective, if your farm business is a positive presence in your life and the life of your community, then why wouldn't the next generation want to follow in your footsteps? "Cultivators of the earth are the most valuable citizens. They are the most vigorous, the most independent, the most virtuous, & they are tied to their country & wedded to its liberty & interests by the most lasting bonds." Thomas Jefferson penned those words back in 1785. I believe he is referring to what we would now call family farmers. Over the last century, most of our agricultural systems have been subject to industrialization. Farmers, themselves, have become more and more specialized. Consumers have become further and further removed from those who grow the food they eat. As consumers, we have very little idea of what goes into our food, how it is processed, and where it comes from. As agricultural control becomes more consolidated, agricultural businesses have less interest in the health and environmental impacts of their decisions and more interest in efficiency and the bottom line. Indeed, much of industrial agriculture's financial advantage comes from exploiting their workers and the environment. On the opposite end of the spectrum lie Thomas Jefferson's family farmers. The sustainable farm tour has brought me face to face with family farmers who care about paying and receiving a living wage, while protecting the environment. They are farming sustainably by connecting to the land and their community, rather than merely exploiting them. They are making this happen through their hard work, their sense of moral responsibility, by connecting with their community, and by passing these values on to their children. Now, I'm going to repeat that last bit, but with some political commentary. Our country seems so divided between red and blue states, between conservatives and liberals, between Republicans and Democrats. If I were to hazard an unfounded guess, I would say that 98% in the U.S. support family farms. But each of us does so with the rhetoric that supports our side of the political divide. First I noted that the family farmers I interviewed care about paying and receiving a living wage, while protecting the environment. These would be issues taken up by so-called liberals. Then I connected this to how these farmers make this happen: through their hard work, their sense of moral responsibility, by connecting with their community, and by passing these values on to their children. These would be values taken up by the so-called conservatives. And, I might add, this is how most of the farmers have spoken about themselves. This comes as no surprise, since I have been traveling through red states (maybe with a tinge of purple). But, perhaps listening to ordinary farmers and ordinary citizens will help us realize that we are not hopelessly divided. Mind you, our politicians are most assuredly polarized and Congress is in lock-down gridlock. However, I would argue that the vast majority of us agree on the fundamentals; it's just political rhetoric that keeps us thinking we are on opposite teams.